National Therapy Animal Day ~ April 30th!! 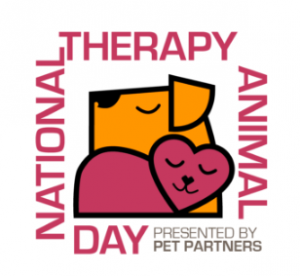 April 30 is National Therapy Animal Day! National Therapy Animal Day was created by Pet Partners to recognize all of the exceptional therapy animals who partner with their human companions to bring comfort and healing to those in need. Therapy animals and their handlers can be found helping people of all ages in a variety of settings including hospitals, pediatric care units, schools, and assisted living facilities.